Affordable magnet base mount antenna. 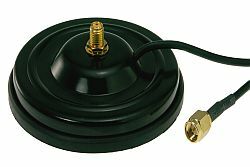 Small magnet base with 65mm diameter and fixed cable. The dual band radiator is connected by thread. Quarter wavelength radiator on 2m, 5/8 wavelength radiator on 70cm. Antenna and base are black anodized, max. power load 70 Watt. Complete antenna with miniature magnet base and radiator. Diameter of base only 40mm. Max. power load 50 Watt. Includes 2m cable RG-174 and connector. Magnet base with 55mm diameter, with 3m cable attached, with SMA connector. 35mm diameter with 2m cable attached, with BNC plug.